Both crossing and connecting disciplines, Gerald Early’s inaugural Humanities Center lecture incorporated history, culture, politics, economics, race relations, architecture, literature, and more. On Thursday, September 24, the Humanities Center welcomed Gerald Early as its inaugural speaker for its new lecture series. Even before the start of Early’s talk, the Hawkins-Carlson Room was standing-room-only, prompting organizers to expand the room to double the event’s capacity. “The humanities are alive and well,” remarked University of Rochester President and CEO Joel Seligman in response. Early is a noted critic and professor of English and of African and Afro-American Studies at Washington University in St. Louis. He was also the founding director of Washington University’s Center for the Humanities. Titled “Noon in the City: Race, Neighborhood, and an African-American Festival in Philadelphia,” Early’s talk—delivered with bravura and charisma—touched on history, literature, politics, economics, race relations, architecture, culture, and more. He began by reading “Among the Believers,” a chapter from his forthcoming book about Philadelphia, where he spent the first 25 years of his life. The chapter spotlights the city’s annual one-day Odunde Festival, the largest African-American street festival in the country. Founded in 1975 by Lois Fernandez, the festival draws hundreds of thousands of attendees and spans 12 blocks in one of Philadelphia’s oldest, historically African-American neighborhoods. In the second part of his lecture, Early outlined some of the challenges and opportunities facing a city like Philadelphia, a majority-minority city in which black people make up a majority of the local population (relative to the whole country’s population). He also explored ideas of gentrification and authenticity in urban neighborhoods like Philadelphia, before taking questions from the audience. Early’s was the first of four lectures planned for the center’s inaugural year (the next one is in early November). For more information about upcoming lectures and workshops, visit the center’s Inaugural Lecture and Workshop Series page. 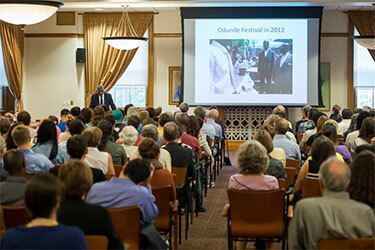 Learn more about the Humanities Center at Rochester.